It's not new that there are both upscale and low-price stores. What is new is that the same people now shop at both of them. That's a central finding of Treasure Hunt by Michael Silverstein. This book describes the bifurcated shopping habits of people who buy expensive luxuries, like an Apple iPad, while cutting costs on basics, like groceries at CostCo. You might call it the shopping law of the excluded middle: mid-priced products tend to get squeezed on price, by low-cost competitors; and on prestige, by luxury products. How do shoppers decide which products to splurge on, and which to skimp on? The products that create an emotional connection are those that people upgrade to. For example, Treasure Hunt profiles Lauren James, a 32-year old single woman in Chicago. Lauren spends $640 a month on clothes and $600 on beauty & wellness to make her "look good and feel attractive." But when she eats lunch alone, Lauren tries to spend less than $10 and "will often make a meal out of… a cup of soup at the 7-Eleven with lots of free crackers." However, she's not always frugal with food: when she goes out with friends or on a date, she'll splurge for drinks, appetizers, and dessert. So when dining becomes a social experience that deepens her connections with people, she's willing to splurge on it. Treasure Hunt suggests, similarly to Paco Underhill's Why We Buy, that women shop for love: they spend on things or experiences that will create closer bonds between themselves and the people in their lives. For many people, eBay is a great online market for these luxury goods: by buying them at auction and below retail price, shoppers can reduce the cost of their emotionally-charged, aspirational purchases. A treasure hunt on eBay can be particularly rewarding when the buyer feels she's gotten a great deal compared to what she would pay in a store. Treasure Hunt presents several other interesting profiles of how other people, from a German housewife to a Japanese "office lady," decide what to splurge on and what to buy on the cheap. The book is an interesting examination of modern bifurcated shopping habits. It's also a warning to mid-level stores and brands: either become a desired luxury brand to sustain high margins, or keep your prices low to be in the treasure hunt, or do both by "spanning the poles" as LG has done. Do you have items you hunt for the best deal on, to save money for luxuries? What are they? All quotes above are from Treasure Hunt. Also by Michael Silverstein: Trading Up. 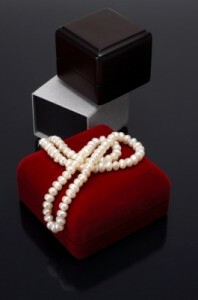 Image credit: Jewelry and boxes: Suat Eman / FreeDigitalPhotos.net.